Uncertainty is indeed gut-churning, but more and more it is intrinsic to our freedom. Rigidity, finite values, texts that can never be questioned? This is what we must fear. 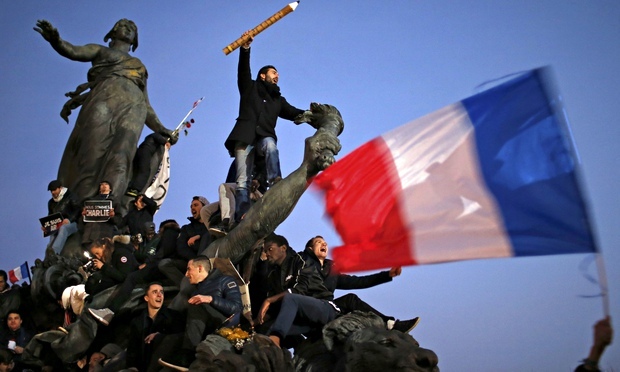 Those drawn to terror cling to an ideology that allows not a glimmer of uncertainty. To doubt is to be weak. Ambiguity is a threat. At that time, Mr Cameron, defended the rights to free speech, at least is recorded to have supported the cartoon. 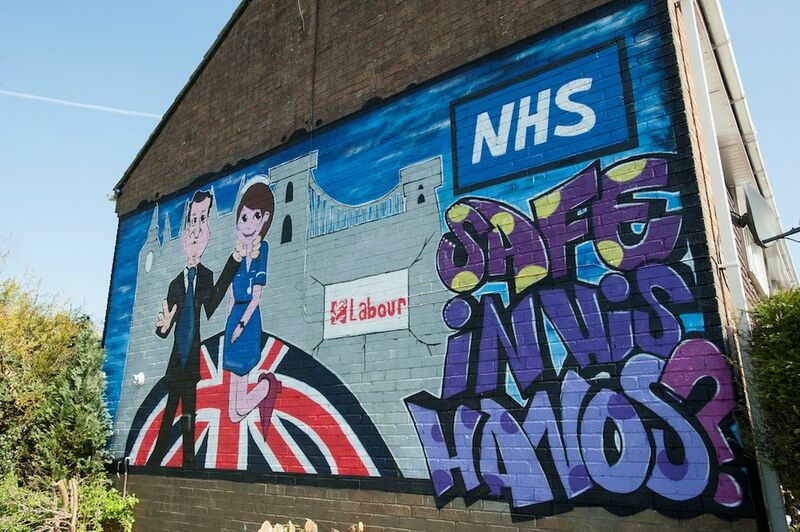 As such a defender of free speech, I imagine therefore that he will also defend the right to free speech of resident in Bristol, who has used the medium of Art to depict Mr Cameron as a danger to the future of the NHS. The Daily Mirror reports that Tony Davis, faces prosecution if he refuses to remove it, he could eventually be fined up to £20,000 under the Town and Country Planning Act. Tony said: “I’ve had a notice of prosecution. If you are a commercial premises you can advertise anything but if you are a private premises you are restricted to a size of 2ft by 3ft. “But this applies to hoardings – not something that is painted on the wall like mine is. Which brings us to the question of why, when there was such an outrage about the events in Paris last summer, are we facing an onslaught of rights, removal of freedoms of which must be defended. Much of the media, newspapers, the News in BBC is controlled by those who seek to control a population which outnumbers them, and in the UK, a government which does not have the majority support of a population, has power to change laws in a parliament which is supposed to serve the people. Very adept at distraction policies, or scare-tactics, the BBC is neither, neutral politically, or independent, even though it still is respected by the belief in neutrality by many. We have asked the question before, Who pulls the strings at the BBC? Now the Guardian reports how Tory officals threatened the BBC during the recent election. Baldwin writes: “BBC executives and journalists have told me that there were regular, repeated threats from senior Tories during this election campaign about ‘what would happen afterwards’ if they did not fall into line. But he claims there “has been a long-standing campaign by the Conservative party, fueled by the commercial interests of sections of the press, to attack the world’s most successful state-funded public service broadcaster as a giant leftwing conspiracy”. And so they hold power, while the scales of justice are so unbalanced they appear to have have a pivotal screw loose. Power could be easily toppled by exposure of truths and myths which has led to the imbalance of truth. The Tories are terrified at the idea of a collective knowledge of truth. Divide and rule, as always, is their aim. They overcomplicate issues leading to doubt and confusion. This is why we must defend everyone’s rights of expression through the Arts, the Internet, Blogs. Even if sometimes we don’t agree with them. If we have a right of freedom of expression, then we also have a right to access information which our representatives are seeking to cover-up because of their own self interest. We are not talking about securing our safety, and protecting the vulnerable. Throughout history many have founght for our rights, from the Tolpuddle martyrs, to the suffragettes, to those who fought against Nazis in the 20th century. This is not something to be cast away because Mr Gove has the power. The Human Rights Act is a piece of law, introduced in 1998, that guarantees human rights in Britain. It was introduced as one of the first major reforms of the last Labour government. In practice, the Act has two main effects. Firstly, it incorporates the rights of the European Convention on Human Rights into domestic British law. What this means is that if someone has a complaint under human rights law they do not have to go to European courts but can get justice from British courts. Secondly, it requires all public bodies – not just the central government, but institutions like the police, NHS, and local councils – to abide by these human rights. Which rights does the Act cover? The Act covers all the rights included in the European Convention. These rights are: Right to life, right not to be tortured or subjected to inhumane treatment, right not to be held as a slave, right to liberty and security of the person, right to a fair trial, right not be retrospectively convicted for a crime, right to a private and family life, right to freedom of thought, conscience and religion, right to freedom of expression, right to freedom of assembly and association, right to marriage, right to an effective remedy, right not to be discriminated against, the right to the peaceful enjoyment of one’s property, and the right to an education. The Act also imposes a duty upon governments to provide free and fair elections. If you haven’t already, please sign now. Link. Trade treaties like TTIP are arranged in secret because those who will benefit from them are a very small minority, and exposure in the public domain would ensure they would be quashed. There is no wisdom in complacency of belief that in the UK because we are some distance from the incident in Bangladesh where a life was lost just because a man had an opinion, we are therefore safe. The struggle for free speech, for free inquiry and for the liberty of atheism need not be a fight against religion, unless religion is opposed to human dignity. It is a struggle against cowardice and conformism, and against everyone who would crush both truth and imagination into a cramped coffin of orthodoxy. Protection of rights, freedoms, and those whistleblowers who dare to speak out is tantamount in preserving the last chance for the voices of the people to be heard and shared – if indeed it is not too late for democracy to have a voice at all. Independent, HRA. What is it and why does Michael Gove want to scrap the policy? Note: CEO is a member of the Alternative Trade Mandate Alliance. Today, a European alliance of over 50 civil society organisations will launch the Alternative Trade Mandate, a proposal to make EU trade and investment policy work for people and the planet, not just the profit interests of a few. The launch is taking place as EU trade ministers and the European Commission are leaving for the World Trade Organisation (WTO) negotiations in Bali next week. “The current trade and investment regime, imposed by the EU and the WTO, isn’t working. Prising markets open for global agri-business is wiping out small farmers and is a major cause of hunger. The deregulation of financial services through free trade agreements impedes tough regulation of the financial sector, paving the way for the next disastrous financial crisis. We need to break away from this corporate driven agenda,” says Charles Santiago, a member of the Malaysian parliament, who is in Brussels to support the launch of the Alternative Trade Mandate. The new 20-page mandate proposes that core principles such as human and labour rights and environmental protection should drive EU trade policy. On several areas, such as food, work, money and raw materials, detailed proposals for change are outlined. One proposal is for the EU to become more self-sufficient in protein and oil crops as alternatives to imports of (genetically-modified) soybeans, palm oil and agrofuels, which are devastating for the environment and small farmers in the global south. The mandate also calls on the EU to hold European corporations accountable for human rights violations, environmental destruction, tax avoidance and tax evasion elsewhere. The mandate also proposes a new process for initiating, negotiating and finalising trade and investment agreements, giving national Parliaments and civil society a stronger role and thereby rolling back policy-capture by big business. “EU trade deals are negotiated behind closed doors in the interests of a few rich corporations. The people who are affected by these deals have never been asked what they really need. We want an open and democratic process, controlled by the people of Europe and their elected representatives, rather than unelected technocrats and corporate lobby groups,” says Pia Eberhardt from Corporate Europe Observatory, a member of the Alternative Trade Mandate Alliance. The proposals outlined in the Alternative Trade Mandate were developed in a four-year process, with public workshops held all over Europe and which engaged a wide range of civil society groups from both within and outside the EU. A series of papers with more detailed proposals on several pressing issues accompanies the main text. The proposals will form the basis of an EU-wide campaign to make trade and investment work for people and the environment, which will first focus on the European elections next May, asking parliamentary candidates to pledge support for the Alternative Trade Mandate. “At a time of multiple global crises, the European Parliament needs MEPs who will stand up for trade rules that work for people and the planet. We need MEPs who will bring trade deals out of the shadows and into the light. We call on MEP candidates to stand up for democratic trade and investment rules that serve people, the economy and the environment at large – not just the profit interests of a few,” says Amélie Canonne, co-ordinator of the Alternative Trade Mandate Alliance. The Alternative Trade Mandate will be launched in Brussels during an assembly this afternoon, where speakers from the global south, crisis-struck countries in Europe, trade unions, migrant groups and the European Parliament will comment on the proposals. Tomorrow, a “walk of resistance and alternatives” will take place through the EU quarter. CEO relies on grants and donations to carry out their research and campaign work. By making a donation or becoming a friend of CEO you help to support their efforts to expose corporate lobbying, increase transparency and urge greater democratic accountability in the EU. This is a leaked version of the European Commission’s communication strategy for overcoming public skepticism about the controversial EU-US trade negotiations, the so-called Transatlantic Trade and Investment Partnership (TTIP). Its aim is to “reduce fears and avoid a mushrooming of doubts”.. but (perhaps unsurprisingly) knowing that, they have set up a ‘communication strategy’, serves to increase anxiety levels rather than reassure. In response to the number of people who have bemoaned their lack of knowledge about the free trade agreements reported in Are we already in the post-democratic era? Trade Related Aspects of Intellectual Property Agreement (TRIPs): agreement imposes 20-year monopoly protection on patents developed mainly by the world’s largest agricultural, chemical, pharmaceutical and genetic engineering concerns. With Trade Rights in Intellectual Property (TRIP), an offensive has been launched not to reinforce competition, but on the contrary, to strengthen the power of technological monopolies—at the expense, of course, of developing countries for whom the possibility of acquiring the technology they need in order to progress becomes even more uncertain. Will the ‘trade secrets’ that GATT-WTO wants to include under this category bring us back to the mercantilist monopoly practices of 300 years ago? Even the language used to discuss the topic is not neutral. We no longer speak of knowledge as the common property of humanity, but rather of ‘piracy’ when someone tries to acquire it! This policy sometimes verges on the obscene: GATT-WTO, for instance, wants to forbid Third World manufacture of inexpensive pharmaceutical products, which are of vital importance, in order to protect massive profits of monopolies in this sector. In this video clip, Noam Chomsky discusses the history and assumptions of the World Trade Organisation. The real surrender of our sovereignty was and is to the WTO and the plethora of trade agreements which it oversees. Has any party mentioned this? Would any admit it? Would any suggest, let alone support a referendum on that loss of sovereignty? Or are they all very happy for those aspects of sovereignty and democratic control to be removed from us completely and without discussion? I suggest this is the real discussion we should be having. But I believe we will not have it and that fact is, for me the measure and proof that our current political leadership has betrayed us and sold us.